All of the types of water reservoirs found around the country will fall into the category of a high, medium or low risk confined space projects. Geoline Ltd has invested a large amount of time and capital to have management and employees certified and trained to the highest levels to allow them to work in these restrictive environments. We have implemented safety procedures that comply with and exceed the demands of the HSA (Health & Safety Authority) requirements. We operate a strict Permit to Work System that has to be fully adhered to and all personnel on site are equipped with rescue harnesses, 10 minute escape sets, gas monitors, 2 way radios, full PPE. We also operate a `Top-Man & Bottom-Man System` when operating inside these reservoirs. 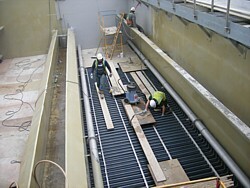 A system whereby fresh air is pumped inside the reservoir and stale air is extracted out is also put in place. We also provide for full rescue of demobilized persons within the work space and we have equipment and fully trained personnel to deal with this in the event of an emergency. Preparation is everything when working in hazardous confined space environments. 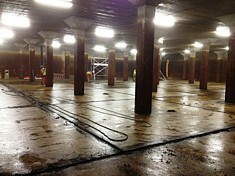 Geoline Ltd normally takes control of the Reservoir after the Client drains down the system. 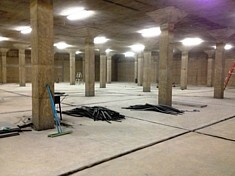 At that stage we Lock-Out all valves, pipe etc that both enter and exit the Reservoir. Only then do we enter the Reservoir to commence the cleaning operation. Over a period of time silt can accumulate in the floor of every reservoir and it will attach itself to the walls and internal columns. 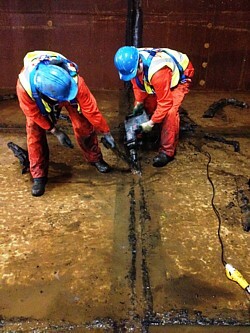 For a lining system to be successfully installed, this silt residue must be removed. 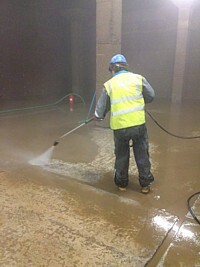 We use a number of methods to remove this residue, namely high pressure washing and/or sandblasting/gritblasting. 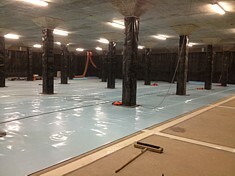 Employees enter a controlled environment to complete this work with all safety measures in place. Full breathing airlines are used in some applications, especially when sandblasting. 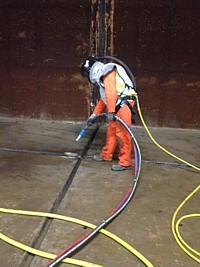 Any surface can be cleaned, from concrete surfaces to steel surfaces on internal valves, pipes etc. 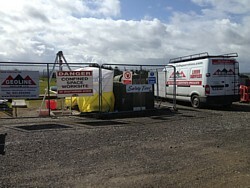 On completion all the debris and silt are removed from the reservoir and disposed of in an authorised landfill site. Only waste operators with a valid waste collection permit are allowed take this material away. In almost all leaking concrete reservoirs the main leakage point is from defective construction joints in the structure itself. 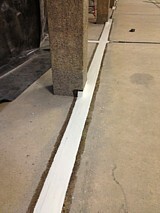 Most of these `mastic type` filling compounds perish over the years and lose adhesion to the concrete joint. This then allows a path for the water to get through. We have a system developed where we totally remove all the defective joint material and replace it with new DWI (Drinking Water Inspectorate)/WRAS (Water Regulations Advisory Scheme) approved materials. 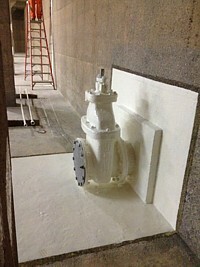 The exposed joints would then be sandblasted, primed and filled with the appropriate filler material. 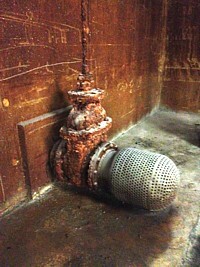 As time goes by, metal valves and pipework inside the drinking water reservoir corrode. By the time that refurbishment works take place, some of these metal components are corroded too far and need to be completely replaced. Others however, may be salvageable. Where pipework needs total replacement, we remove the old metalwork and replace it with custom made HDPE replacement fittings. 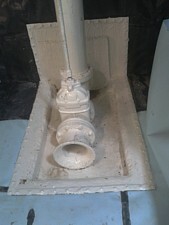 The new components bolt on to the existing pipework outside the reservoir, penetrate the side wall of the reservoir and sit happily forever more inside the reservoir. The benefit of replacing the old steel with new HDPE components is that we can also weld the new lining system to the HDPE fitting, thus creating a 100% seal. HDPE will also never corrode, and it will give a lifetime repair. When components are structurally sound and still working fine, except for external corrosion, we sandblast these until they are back to new metal again. 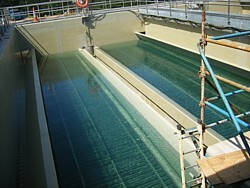 We then apply a DWI/WRAS (Drinking Water Inspectorate / Water Regulations Advisory Scheme) Approved coating system to them. This will extend their life by another 50 years. All internal lining systems used inside drinking water reservoirs must comply with legislation for it to be used when in contact with drinking water. Authorities nowadays look for DWI Approval, WRAS Approval or EN Approval on the lining systems that are proposed to be used. Geoline Ltd specialise in a variety of lining systems that comply with these requirements. Once installed, these systems can be electro-statically tested and hydro-statically tested to ensure a full seal has been achieved. The Geomembrane lining systems involve individual panels of liner being welded together to form a continuous seal. There are two type of welding technique, namely extrusion welding and hot wedge welding. The extrusion welding is used on small, irregular shaped sections of the liner and it incorporates a copper wire in the weld seam. This is later used in testing the weld seam for leak paths. Hot wedge welding is used for long straight seams. 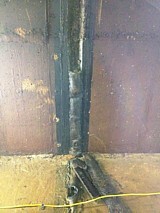 It incorporates two weld seams with an air channel inbetween. 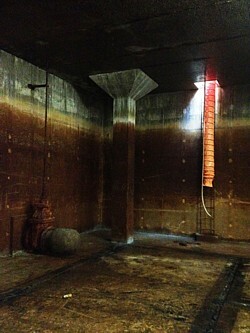 The air channel is later used to test the integrity of the welds. The geomembrane itself will come to site with a quality control certificate and it will be free of any defects. 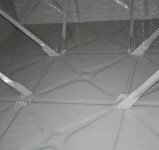 However, in areas where there is a lot of fabrication works need, we place a layer of conductive geotextile under the area in question, before we install the liner. When the liner is installed, this conductive geotextile allows the liner to be electro-statically tested to ensure no leak paths are present. With regard to Spray Applied Coatings, the surface to receive the coating is sandblasted clean. 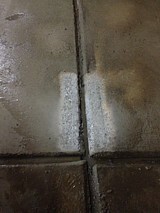 A sealer layer is then applied to the area and let cure. The two coats of DWI / WRAS Approved 3M Skotchkote 165PW are applied to the area, each coat curing before the next coat is applied. This product is completely solvent free, has high impact resistance and can accommodate movement with high crack spanning capabilities. The finish service is easy to inspect and clean and will resist the growth of micro-aquatic organisms. It also resists the ingress of water, oxygen and chlorides. Baffle Curtains are installed in drinking water reservoirs to improve flow characteristics/patterns and increase the effectiveness of water treatment. 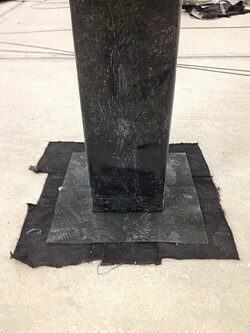 The Baffle Curtain itself is manufactured from Hylam FPA (Flexible Polypropylene Alloy) geomembrane which has full DWI/WRAS approval for use in drinking water reservoirs. Others have been made from HDPE. The geomembrane curtain is mechanically fixed to the roof, walls and floor of the reservoir, while at the same time, not compromising the seal on the reservoir lining system. 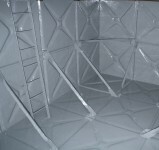 The baffle curtain directs the flow of water into the longest possible path through the reservoir eliminating short-cutting in the water treatment system. Short-cutting occurs when water flows directly from the inlet to the outlet across a reservoir. It can create stagnant areas of water that does not receive the same water treatment. Additional chlorine may have to be added to the water to compensate for this short-cutting. Baffle curtains can be manufactured to any dimension in our factory. All securing mechanisms and curtain support framework are made from stainless steel. 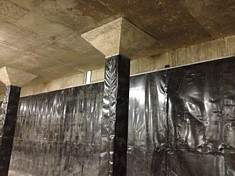 A fully installed baffle curtain is designed for full immersion in water over a long period of time. In our experience, a lifespan in excess of 30 years + is achievable using our baffle curtains. Both newly constructed concrete water reservoirs and existing structures may require a waterproofing layer applied to their roof”s before being put into service. 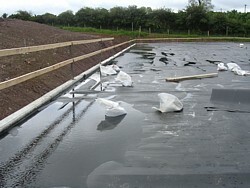 With new structures it is now the norm to see a geomembrane HDPE Liner specified on the drawings. On older structures, cracks may have developed in the roof slab over time and as a result, contaminants are getting in to the treated water. We undertake the complete works involved to refurbish these older reservoir roofs. We complete all concrete repairs necessary in the roof slab and treat all re-bar for corrosion damage. We then install our lining membrane to the roof slab and mechanically seal it to the perimeter and any penetrating upstands or pipe etc. 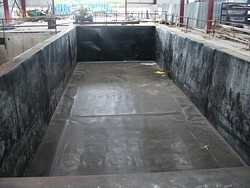 This geomembrane liner is usually 2.0mm HDPE, and sometimes a non-slip surface is required on the membrane. Finally we place a 75mm deep layer of washed round walking gravel on top of the membrane to protect it from foot traffic and wind uplift. All exposed steel works, manhole covers, vents can be upgraded during this process too. 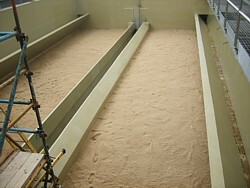 Sand Filters are used in nearly all Water Treatment Works facilities. The quality of surface finish on these structures can vary, depending on their age and condition and depending on the specification required on the project by the Engineer. It is not uncommon for brand new structures to require a lining of some sort, especially one that is DWI Approved (Drinking Wtaer Inspectorate) or WRAS Approved (Water Regulations Advisory Scheme). 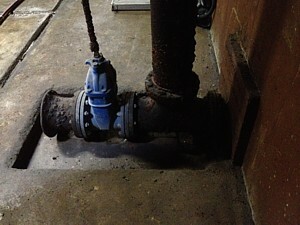 Other older structures may be leaking and require a lining system to solve this problem and prevent ground water contaminants entering and mixing with the water inside the filter. 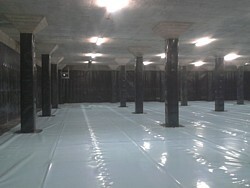 The 3M Skotchkote 165PW is a solvent-free Urethane coating that is spray applied to concrete structures. It has full DWI/WRAS Approval. It has high adhesion to concrete and resists the ingress of water oxygen and chlorides. It can accommodate differential movement in the concete structure and has a high crack spanning capability. This product is always applied in temperature controlled conditions. HDPE (High Density Polyethylene) Geomembrane is a loose fitting plastic liner, fitted to the inside of the structure, following all contours and penetrations. It is mechanically fitted to the top perimeter of the sand filter by a stainless steel batten, bolt and gasket arrangement. All panels of liner are welded together on site to perform a 100% seal, all weld seams are tested on completion to ensure no leak path remains. 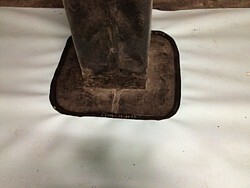 This is a very robust liner and will withstand the constant cleaning operations associated with sand filters.